Ah, pools. Whether humble aboveground 15-footers or elaborately designed in-ground beauties, swimming pools are refreshing oases in backyards everywhere. They can be exercise-inducers, playgrounds, or simply soothing surfaces on which you can float and soak up vitamin D.
Pools are even nice just to look at—except when they’re not. Perhaps more than any other landscaping feature, a neglected pool radiates an air of sadness. If yours has gotten rundown, you probably want to avoid it rather than dive right in. Fortunately, it’s possible to rejuvenate a pool. A new lining might be the simple solution for an aboveground pool that’s lost its luster. 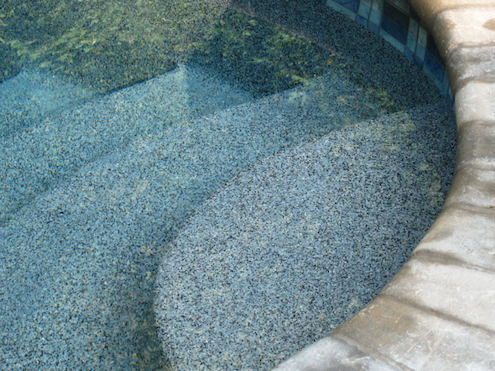 If you want to perk up a tired fiberglass or concrete in-ground pool, consider resurfacing. Thanks to its flexibility and resistance to shifts in the ground, fiberglass is a popular choice for resurfacing. To begin, your contractor will make things as smooth as possible by filling in, reinforcing, and sanding any cracks or chips. After that begins a multi-layer application process. Resin and fiberglass coats are applied and then sanded. Finally, up to three top coats—available in a variety of colors and textures—seal the job. What are the advantages? For starters, fiberglass lasts longer than concrete or plaster. Also, fiberglass is smoother, so it absorbs fewer chemicals and less organic material. Fiberglass resists algae stains, too. When correctly done, you are left with a good-looking pool likely to last a good long time. 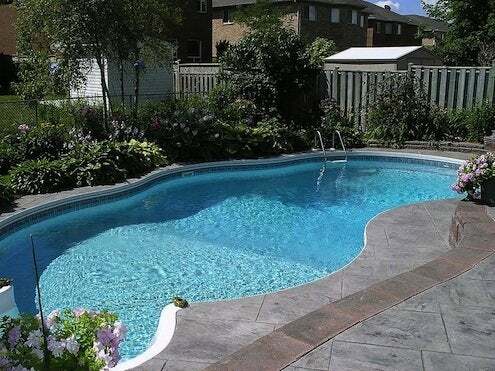 If you want to resurface a concrete pool, your most economical choice is plaster. Certain products, such as Sider-Proof, actually make resurfacing in plaster easy enough for a do-it-yourselfer to tackle. An experienced professional will either chip or sandblast the old plaster out, leaving the original concrete shell. Next, a bond coat is applied that is topped with one or two coats of new plaster tinted to your choice of color. Unlike fiberglass, plaster will react with pool water over the course of its lifetime, so more chemicals may be necessary to maintain proper water chemistry. To counteract this issue, add a “filler” to your plaster mix. Quartz and pebbles are common additives. Quartz is more stain-resistant than plaster; when the two are mixed together, you get an improved, durable surface that adds true sparkle to your pool water. QuartzScapes by NPT and DiamondBrite by SGM are popular quartz-plaster blends. Pebble-plaster aggregates like Pebble Tec or Pebble Sheen are some of the most expensive options in this category, but they create a striking look as well as a smooth, river rock-like texture underfoot. Additionally, pebble blends are the most chemical- and stain-resistant of all plaster techniques. If your fiberglass or concrete pool is in decent shape, consider painting instead of resurfacing it. Water-blast the old paint off, then spray on a new coat of epoxy paint, such as Nu-Pool), which should last seven to 10 years. Rubber-based or acrylic paint may also be used, but neither is as durable as epoxy paint. Still another option for bringing your pool back to life is retiling. Here, it’s the same as indoors: A scratch coat is applied, tiles are laid, and grout is put in between. Depending on the size of your pool, of course, tiling can be an extremely expensive and time-consuming process. But it will give you an elegant result.